As I walked to the train yesterday, it occurred to me that the anniversary of my first blog post must be quite near. And so it is – it’s today! When I began, I wasn’t completely sure of the direction I would take, but I’ve come to realize that what I like most to write about is the intersection of food and life. I love to cook, I do love to eat, but it’s when those activities connect with the people and events of my life that the words flow most easily. So here’s how food connected with the Great Snow Storm of October 2011 . . .
Knowing that the forecast called for snow, and wanting to dive into one of the 29 recipes I had dog-eared in Melissa Clark’s In the Kitchen with a Good Appetite, I decided to make Ale-Steamed Mussels with Garlic and Mustard for Saturday’s lunch. 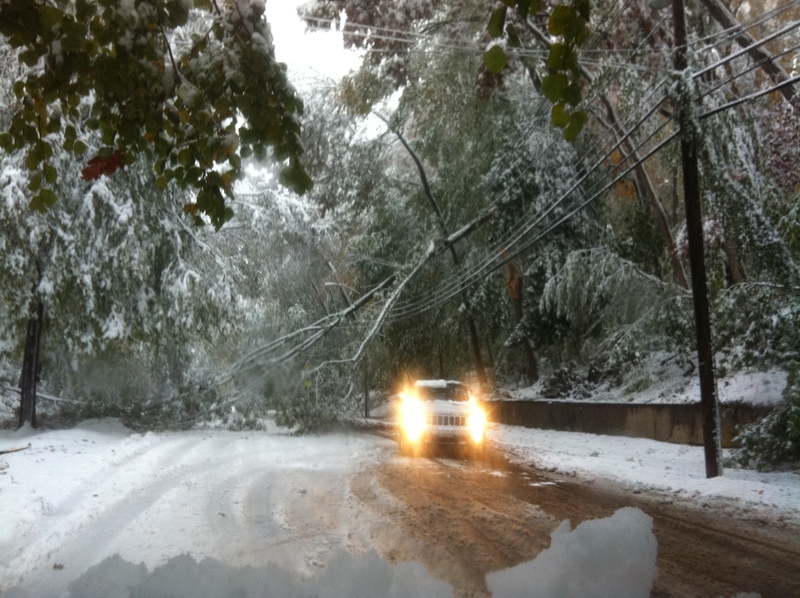 As snow fell and leaf-filled trees began to bow under the weight, garlic, thyme, and ale steamed through my apartment. That and a bottle of ale, made a perfect greeting for Dr. S, who had narrowly escaped multiple fender-benders on his trip north. 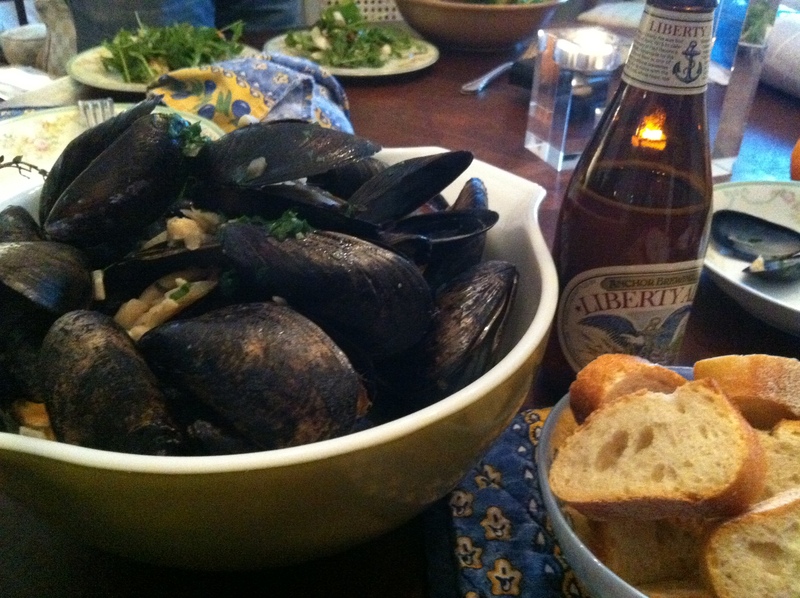 We sat down to a heaping bowl of mussels, a baguette, a salad of arugula, endive, cranberries, almonds, and Bayley Hazen Blue, and bottles of Anchor Brewing Company’s Liberty Pale Ale. Out of respect for copyright laws, I’m not going to print Melissa’s recipe here, but I will tell you that where she called for 3 cloves of garlic, I used 6. 3/4 c. of ale? How about a bottle, can’t really have too much broth! Shallots? Damn – forgot those at the store, went with half a sweet onion. I figured there wasn’t too much you could do to mess up a mussel recipe. And based on the fact that when lunch was over not a mussel remained and the better part of a baguette had been used to sop up the broth, I’d say there’s at least one person who agrees with me. 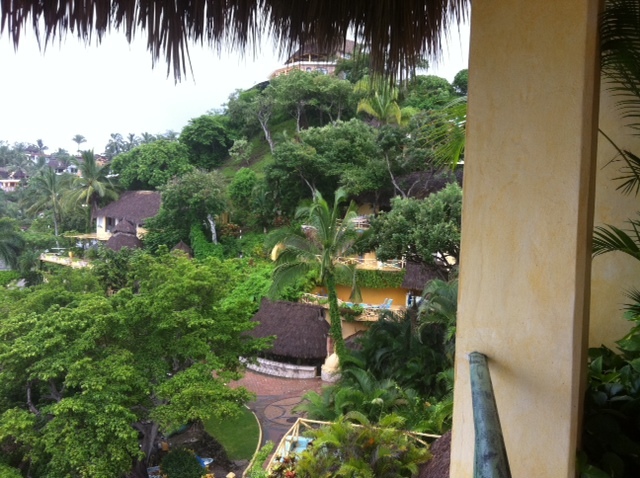 We arrive in Sayulita around 1:30 p.m.
Our room being not quite ready, we drop our bags and head into town in search of our first meal. and around the town plaza. We come upon a woman in an alley cooking split chickens on a large charcoal grill. We pause. 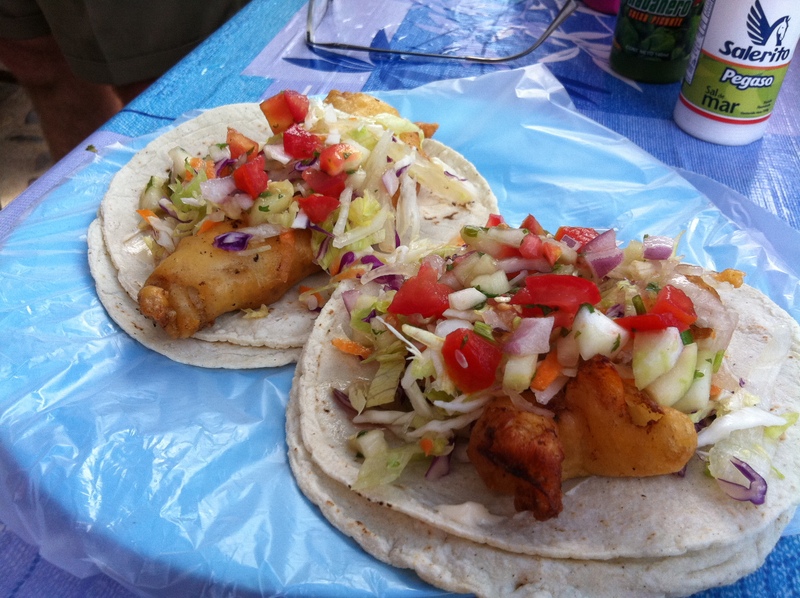 But no, there are days ahead for pollo al carbon and today’s plan is fish tacos. A block past the chicken lady we come to two side by side taco stands, set up on the sidewalk, with a couple of plastic tables on the street. We choose the stand with more customers, and after a brief review of the handwritten menu affixed to the back wall of the stand, we order 2 fish and 2 shrimp tacos. And then we wait. Two women seated at the counter bar are eating their meal in courses, ordering something new each time they finish the plate before them. Our order is not making its way into rotation until the man handling the drink orders gestures towards us as he whispers a reminder to the woman running the stand. A few moments later our tacos are before us. Doubled fresh tortillas are filled with crisp battered shrimp and fish, topped with shredded cabbage, chopped onion, cucumber and tomato. 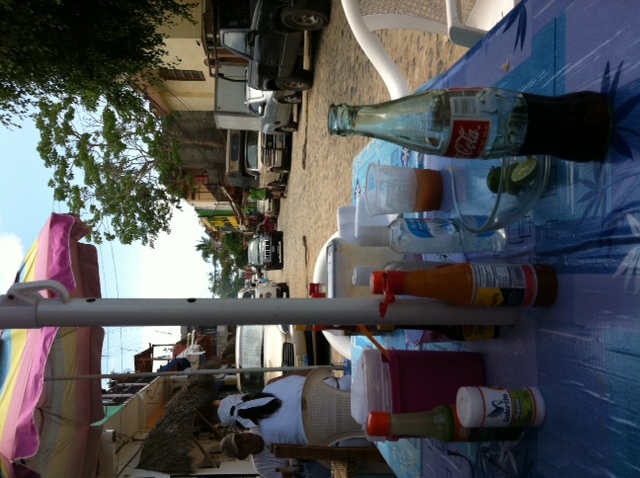 On the table are a variety of hot sauces, limes, and a pale pink crema sauce. 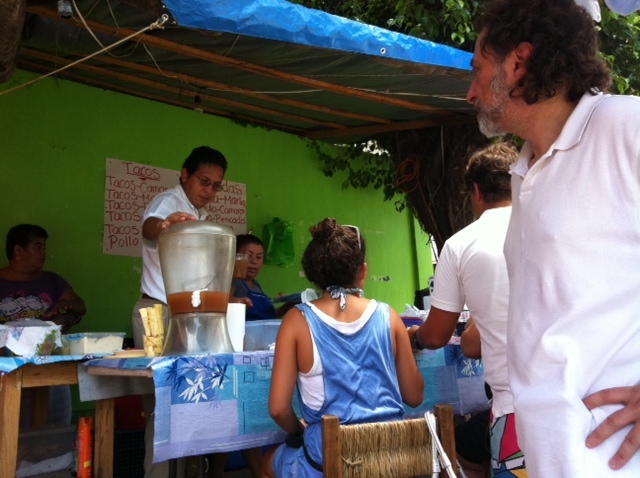 We both add a spoonful of crema and a squeeze of lime to our tacos, and after my first bite, I share with Dr. S my immediate reaction – I could be happy eating fish tacos for every meal of our trip. Fast forward from Mexico to Cape Cod, where I am in the midst of an extended family vacation. 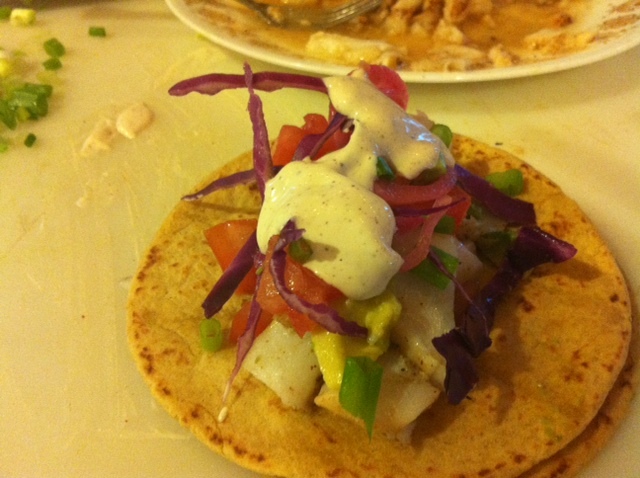 I offered fish tacos as my contribution to one of our group dinners and they were a tremendous success. I marinated fresh cod in lime juice, olive oil, garlic, cumin and chile powder for about 45 minutes before grilling. Unable to procure any Mexican crema from the local markets, I prepared a substitute by mixing sour cream and bit of mayonnaise with lime juice, salt, cumin and chile powder. 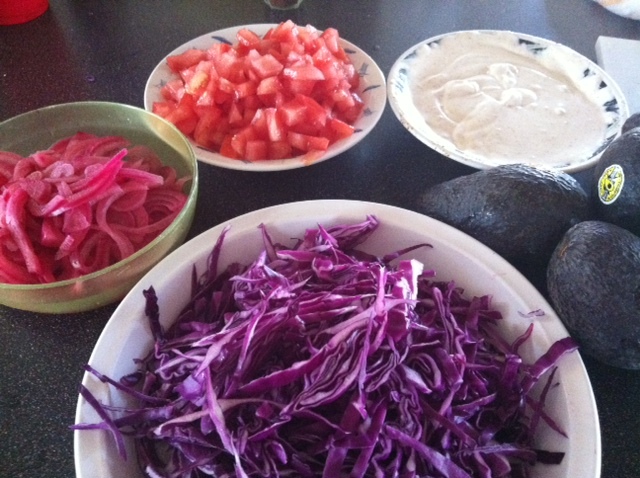 Purple cabbage, avocado, pickled red onion, chopped tomatoes and scallions, and cilantro were the additional toppings. Sipping my margarita and taking a bite, I could just about imagine that the waves outside were those of the Pacific. After a day of reading and resting, which had been somewhat imposed by rain that had persisted through the night into the day, we were ready for outdoor activity and adventure. Well-sunscreened and armed with a big bottle of water, we set off with a loose plan to head for the northern end of Sayulita’s main beach, which appeared to be fairly deserted. Though they’re welcome to sleep beneath our beach chairs, and Dr. S even went so far as to share our bottled water with one such lounging pooch, no one would mistake us for dog-lovers. The homes along this stretch of beach, a mix of large villas with landscaped lawns and gated condo complexes in palm-tree shaded lots, were quite different from “our” part of town. Eventually, these gave way to jungle, and we found ourselves on empty beach headed toward an outcropping of rocks. We suspected that if we could make our way over or around these rocks, we’d find Playa Las Cuevas, a tiny horseshoe-shaped beach favored by those seeking a little privacy. Forceful waves crashed up against the rocks, and though we could see sand as each wave receded, I was inclined to go over the rocks rather than try to scoot around in between waves. As I surveyed my options for descent, Dr. S appeared to offer a hand down, having made his way around between waves without problem. We now found ourselves on a small crescent-shaped beach, backed by steep rocky cliffs rising to the jungle. There was no way to move further north, as the rocks at that end jutted out into deep water and offered no easy way over. The cliffs would provide some shade until the sun moved higher in the sky, so we spread out our towels, pulled out our books, and appreciated the sound and sight of nothing but the ocean and diving pelicans. A review of our reference information convinced us that this little patch of beach was not, in fact, Las Cuevas, but we were more than content nonetheless. 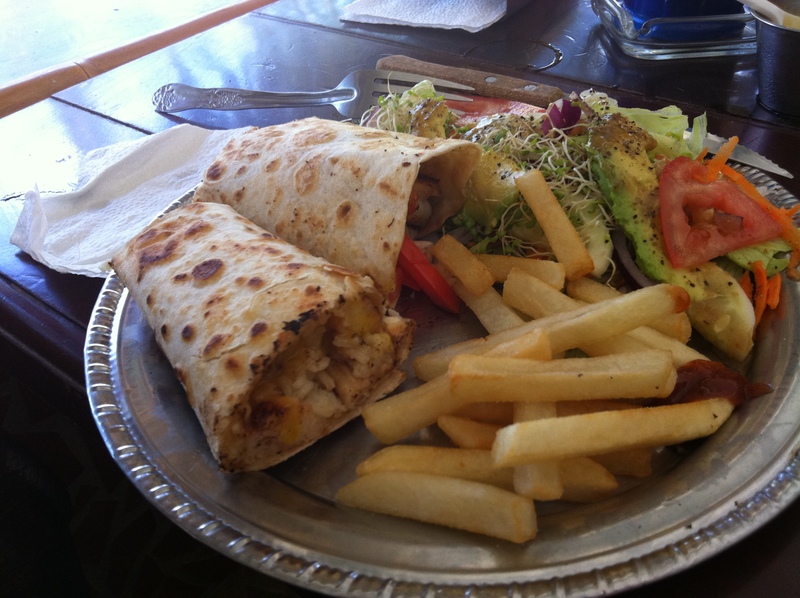 A few hours passed, the sun discovered us, and we decided it was time to begin thinking about lunch. 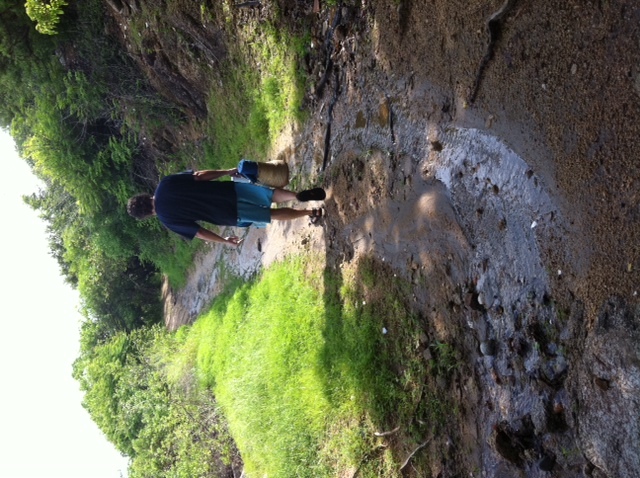 We also decided that we would try to find the “jungle road” for our return to Sayulita. Following an arroyo away from the ocean, and into the jungle, we soon hit a path and made the leap of faith that this was the jungle road and that a right turn would bring us back to Sayulita. 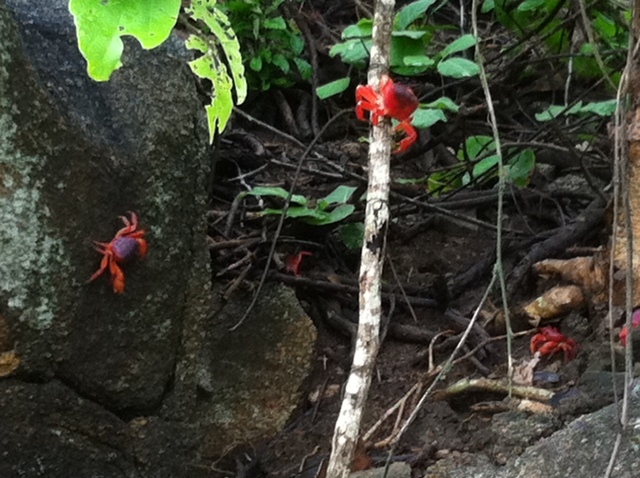 It was along this walk that we became acquainted with the ubiquitous land crab. 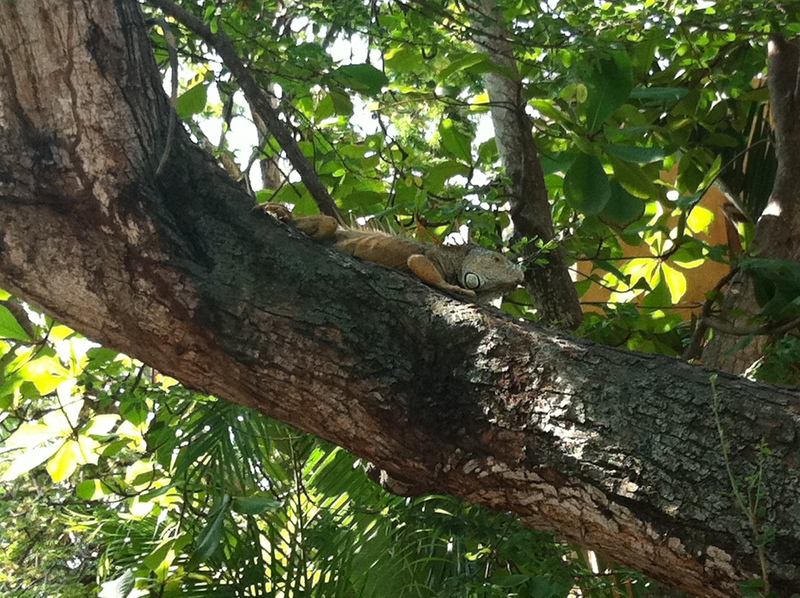 After some initial uneasiness at the sight of them, we quickly realized that they were as happy to avoid us as we them. 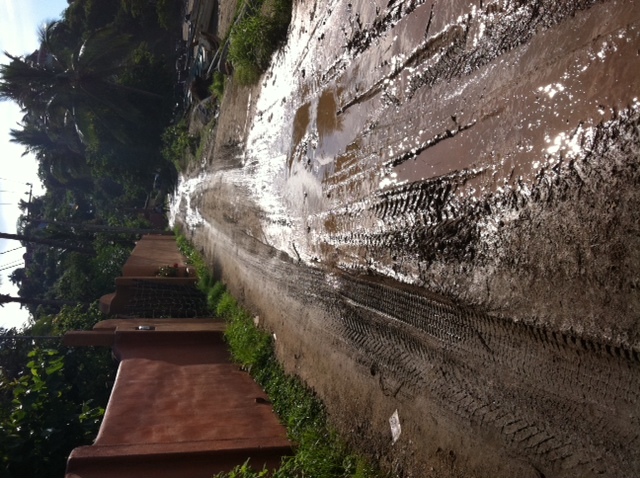 The dried palm leaves on both sides of the path crackled and popped as the crabs ran for cover at our approach. 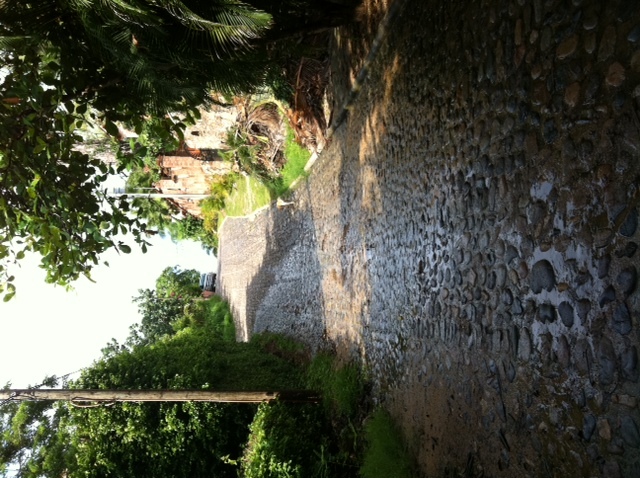 finally meeting up with a cobblestone road beside a large home. 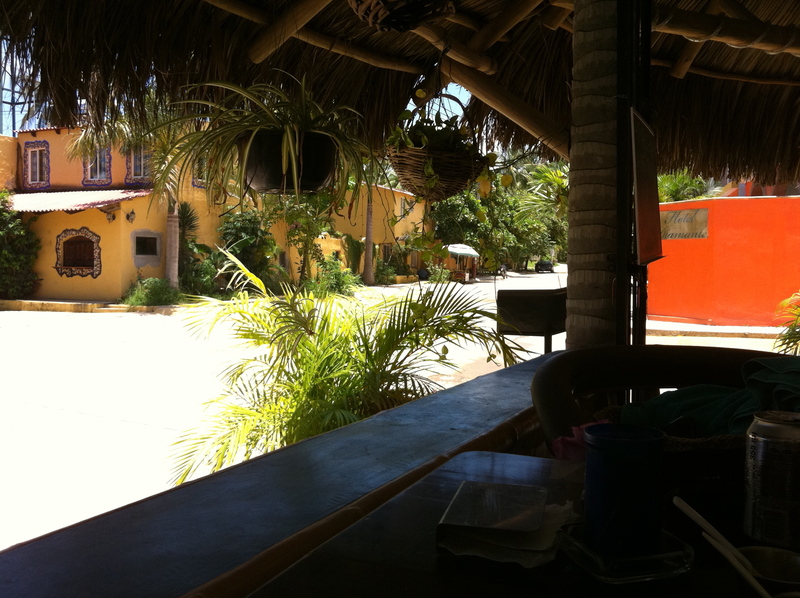 We followed the road into a part of Sayulita we were unfamiliar with, passing the elementary school, and eventually arrived at the Medusa Grill & Bar. 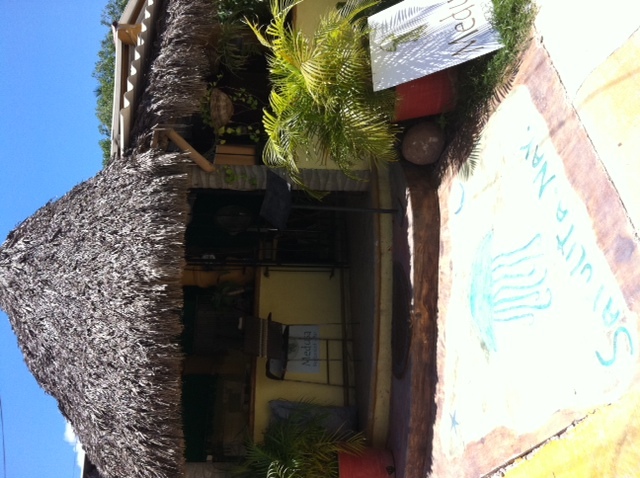 With its palm frond thatched roof, open walls, and promise of food and cold drinks, it was a welcome sight. The sign on the door showed the hours to be 1 – 10 p.m. It was now 1:30, and we could see the proprietress busy in the kitchen, but the restaurant was empty and had the air of being not quite open. Tuckered out from the hike in the midday heat, sweaty and hungry, we sat down at a table beside a large fan. A toddler, apparently the son of the owner, came over and gave us a big grin of welcome. A young woman, perhaps his older sister, brought us menus and took a drink order. It was the frostiest cerveza we had had so far. A little bit later arrived a shrimp burrito for me, and a fish burrito for Dr. S.
As we finished our cervezas, enjoying the breeze from the fan, and the pleasure of simply sitting in the shade after an active morning, bellies full and nowhere to be, the owner brought over a small silver bowl of fresh strawberries, topped with a spoonful of crema and a sprinkling of raw sugar. 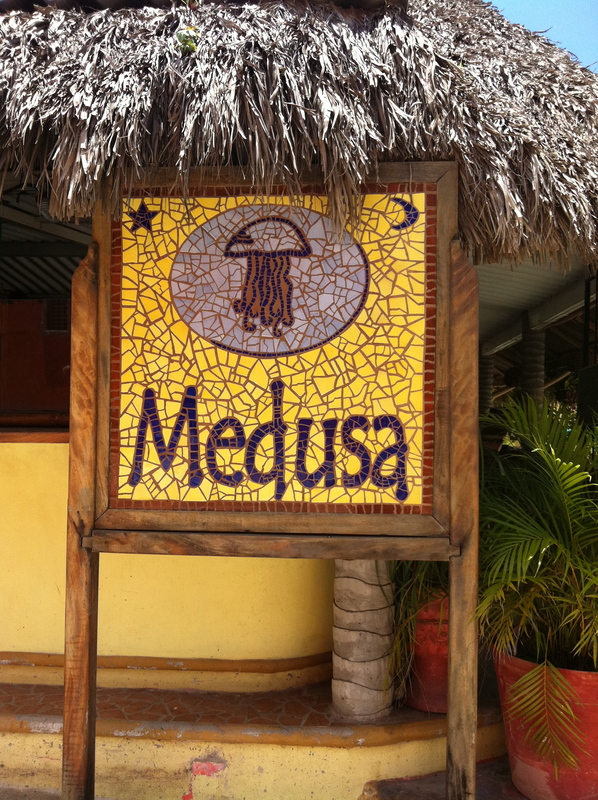 When we finally achieved sufficient motivation to head back for some more hard time at the beach, I tried to figure out how we might work a Medusa dinner into our remaining days in Sayulita. But, alas, it was Wednesday and we had a mere three dinners left but now more than 5 contenders. And as it turned out, another Medusa experience was not to be. But here’s what I like to say about that – – next time! After attending a concert there a good many years ago, this past Sunday I returned to Bargemusic, a chamber music venue located on, yes, a barge, moored just south of the Brooklyn Bridge. We listened to Mahler, Mozart, and Brahms (the electrifying 4th movement of his Piano Quartet No. 1 in G minor had us all on our feet, practically cheering – one audience member had actually shouted out a “Bravo” in the midst of the 4th movement), before heading back out into the August-like heat of the late afternoon to consider our options for the approaching evening. Hmmm, what to do, where to go, most important – what to eat? Atlantic Avenue for Middle Eastern food? Park Slope for whatever we happened across? Back over to Chinatown? No, nothing doing. Our parking spot was too good. We were hot, and soon to be hungry (though we had quelled my threatening sea-sickness – yes, the barge does unfortunately do some rocking – at intermission with a shared bean and cheese quesadilla from the Calexico Mexican food cart), and it was feeling important to me that we find just the right place to complete our thus far very right day. We walked, we looked at a couple of menus, and I pulled out my phone. 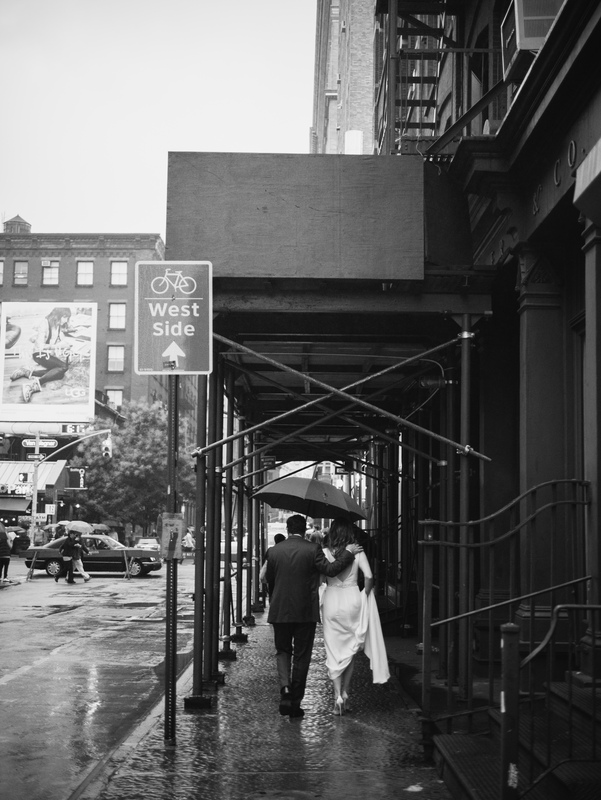 Zabella is my work colleague, has lived in Brooklyn, and having many friends there, continues to know the territory. I felt sure that if she responded, she would not lead us astray. Me: Hi – we’re in DUMBO – do you have any good recommendations for fun dinner place? 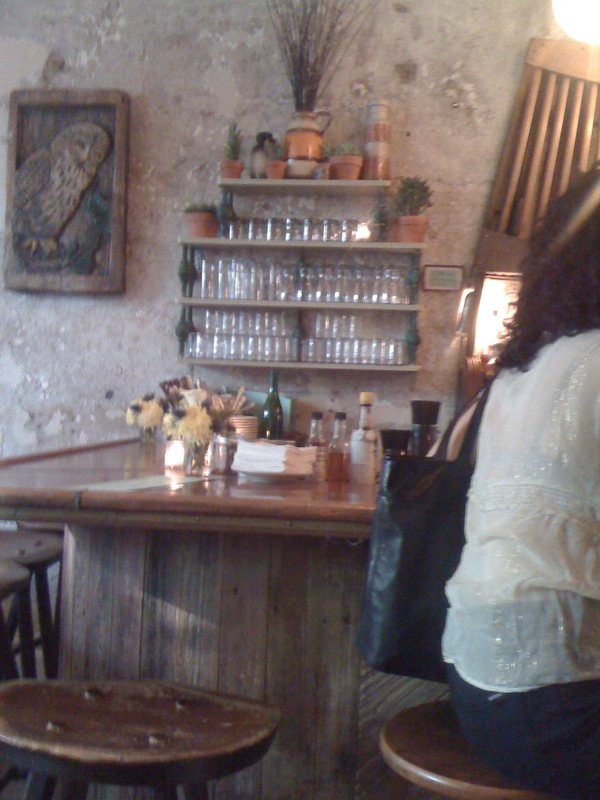 (almost instantaneously) Zabella: Yes, Vinegar Hill House. Have fun!! A quick Google map search informed us that 72 Hudson Avenue was a mere 4ish blocks from where we were parked on Pearl Street. We headed north on Water Street, away from the gourmet chocolate shops and onto blocks containing a renovated loft building here, a vacant warehouse there. When we finally reached Hudson, it seemed quite possible that we had made a wrong turn. Aside from a closed kosher butcher, there wasn’t another retail establishment to be seen. “Look! A couple! 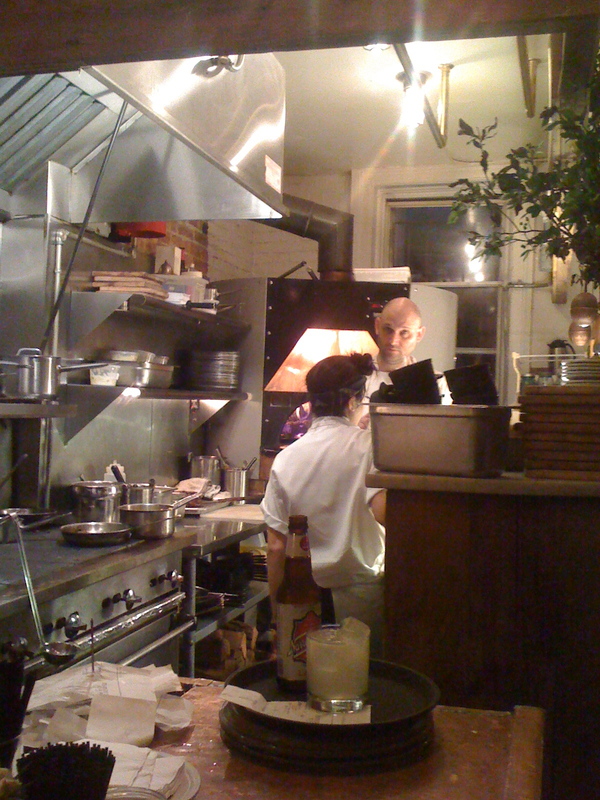 Let’s see where they’re headed!” Vinegar Hill House, as it turned out. 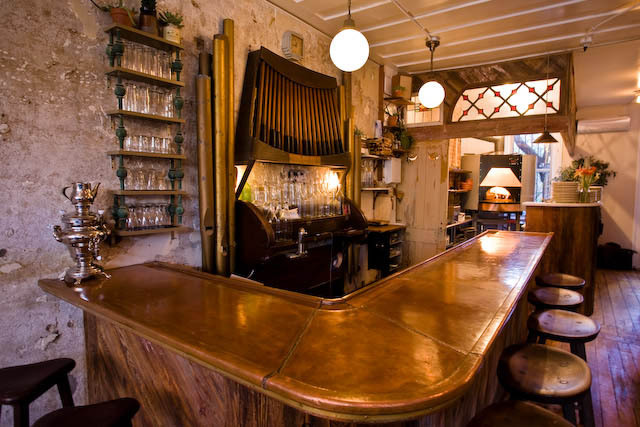 Plaster-exposed walls, cacti-filled shelves, filament-glowing light bulbs, carved wood tables in varying shapes, and a friendly, tall, blond, Brooklyn-cool hostess greeted us. It was just 6 p.m. and approximately 5 tables were occupied. We were seated quickly, and grinned at each other in self-congratulatory satisfaction. A bottle of rosé was promptly ordered, and I relaxed in the comfort of knowing we had found just the right place. 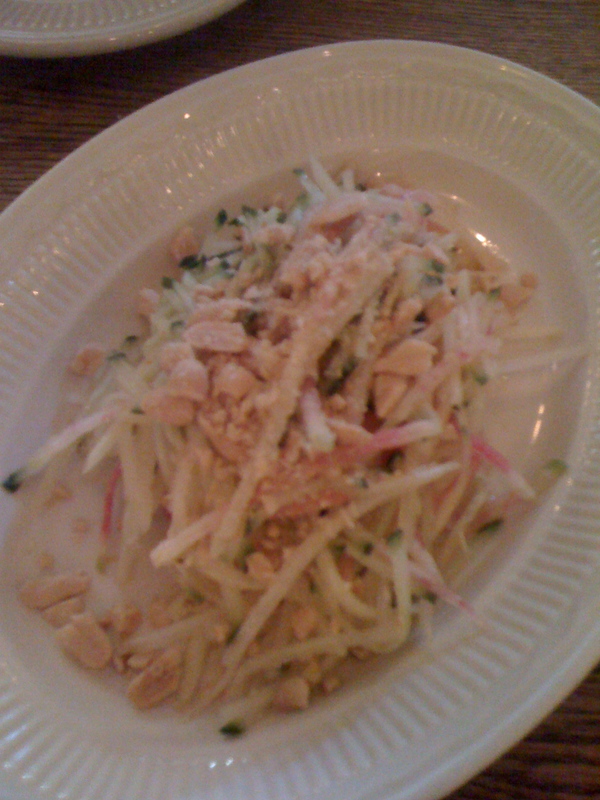 First course: Green Papaya Salad – matchstick pieces of green papaya, rainbow radish, cucumber, peanuts, cilantro, vinegar. Perfection on a 95˚ day. We opted for the two specials for our second course – walnut and hazelnut encrusted brook trout and a far-too-small plate (in its defense, it was an appetizer special) of homemade pappardelle with artichoke hearts, snails, and lemon. A side dish of roasted asparagus under a blanket of melting Parmesan rounded things out. I think I may safely say that there was not a happier pair in the restaurant, and by this time, the place was overflowing with under-35 Brooklyn folks. 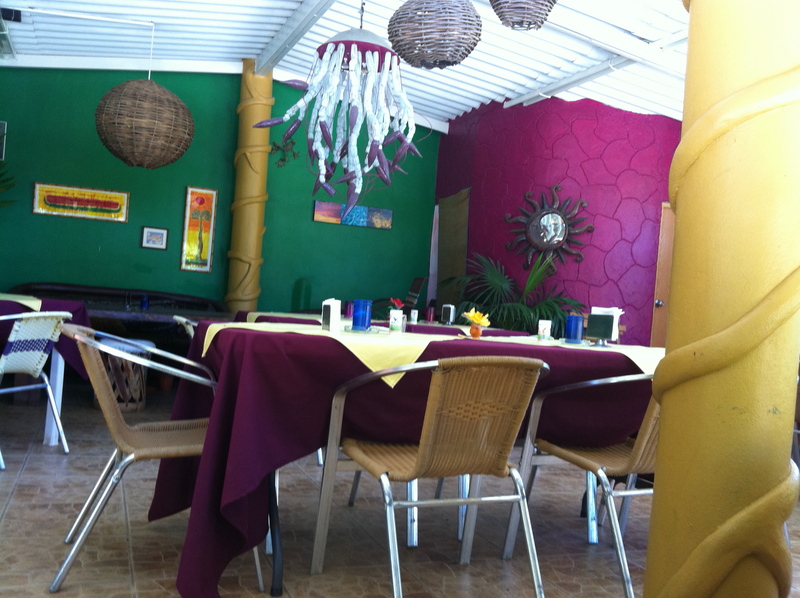 They filled the tables, the bar, and the light-strung garden. But we couldn’t give up our table just yet. Despite a general disinclination toward desserts, my “very funny and very smart scientist” friend was swayed. Salted caramel custard was ordered. And consumed in its entirety. Oh, Zabella – I KNEW we could count on you! After a weekend road trip to visit friends in the nation’s capitol (little did we know the intrigue that was afoot as we strolled past 1600 Pennsylvania Avenue on Saturday afternoon), which included the consumption of mussels in a cilantro and coconut milk sauce at Bertha’s; baseball-size crab cakes from Faidleys Seafood; home-roasted salmon followed by berries with a brown sugar, amaretto sour cream sauce; fried artichoke hearts, NY strip steak, and Belgian beer; and finally Sunday-morning eggs Benedict, by our return home on Sunday evening, we were ready for the easy comfort of a big bowl of pasta. 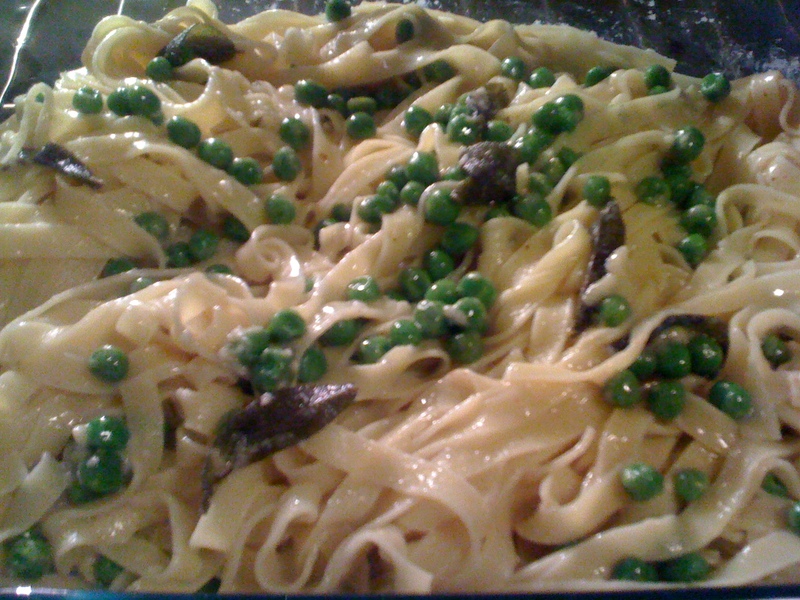 I suggested a recipe my trusty traveling companion had found in The NY Times a few years back – Fettucine with Butter, Peas, and Sage Sauce. Agreement. After a quick stop at the grocery store, dinner was soon in the making. 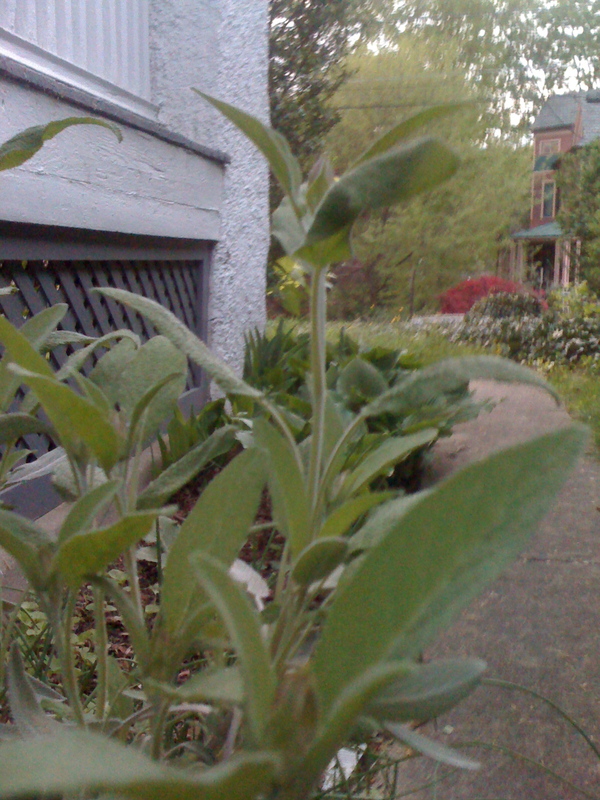 My beau has himself a lovely little herb garden, and the sage is already a good 8″ high, so I had no trouble procuring the requisite 12 leaves, though it was so much fun to pluck them that we went this evening with 20. When I returned to the kitchen, wine had been poured, water had been put up to boil, and a stick of butter was melting on the stove. The sage was tossed in with the butter to stew a little bit, and I leaned back against the counter to enjoy my wine, while my host measured parmesan, toasted some pine nuts and prepared a salad dressing. I love cooking. And I love cooking for and with Dr. S. But there is something so very delightful about watching Dr. S. cook for me, for us. I don’t know that I will ever tire of it! (Remind me to tell you about the recent breakfast he prepared out of dinner leftovers. . .) So my contribution to this meal preparation was minimal. Other than picking the aforementioned sage leaves, I tossed the butter sauce onto the pasta, popped it in the oven, and lighted the dining room candles. Here’s what dinner looked like as it went into the oven . . .
And here’s what it looked like on the table . . .
And in case you’d like your own dish of this comforting pasta next Sunday night, here’s the recipe, courtesy of The NY Times, but with our own secret ingredient added at the end! 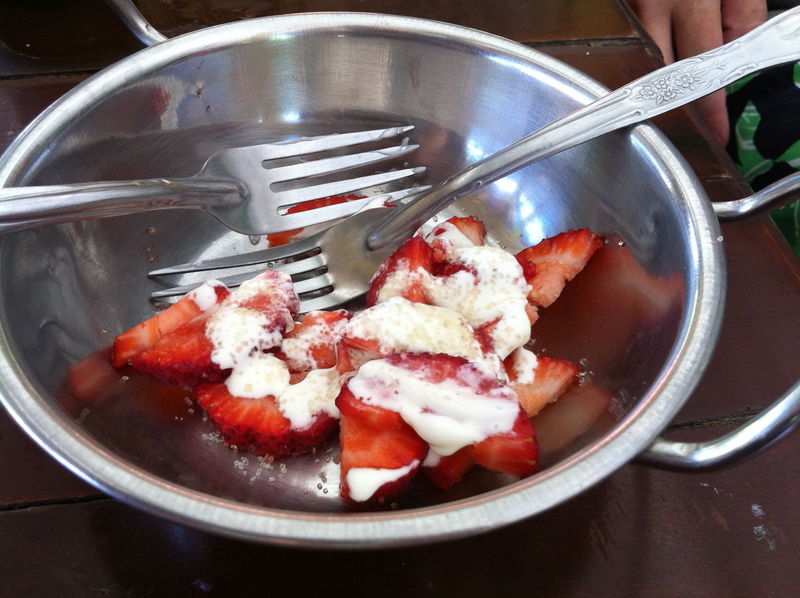 Optional: J’s secret ingredient – Truffle Salt!!! Preheat the oven to 325 degrees and put the pasta water on. Melt 1/4 c. of the butter in a small saucepan, and add the sage leaves. Cook until they’re crisp – but not burnt! When the butter begins to brown, add the peas and cook, stirring, for 1 minute. Add 1/4 c. water, cover the saucepan and reduce the heat to low. Cook for 10 minutes. Season with salt and pepper to taste. 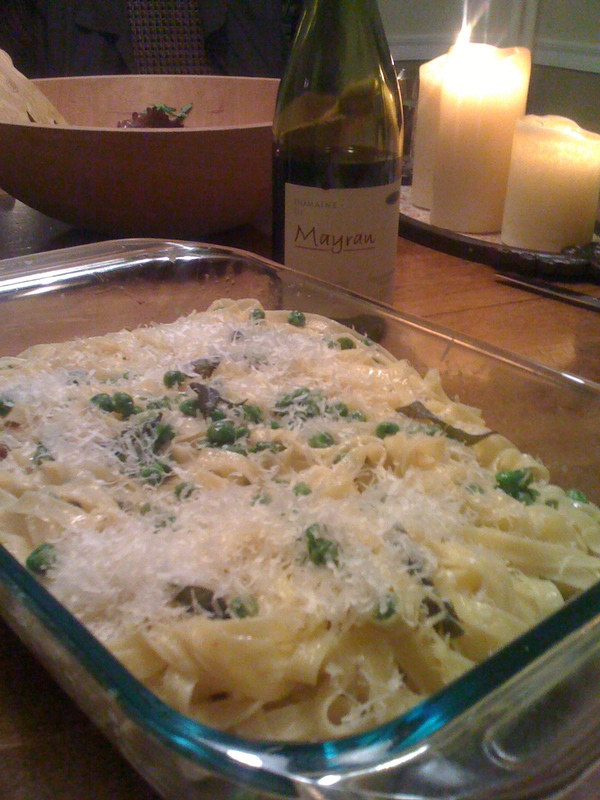 Cook the fettucine, drain well and, in an ovenproof dish, toss with the remaining 1/4 c. of butter, 1 c. of the grated Parmesan and the pea and sage mixture. Place in the oven for 5 minutes. Sprinkle with the remaining Parmesan, and, if the idea does not offend you and you are so fortunate as to have it in your pantry, serve with truffle salt on the side!